Selma: Did Martin Luther King, Jr. love America? CARE TO READ MORE? Film reviewer Edward McNulty gave the movie “Selma” 5 out of 5 stars. Click the photo to read McNulty’s entire review. This weekend begins the 50th anniversary of the historic Selma to Montgomery marches. I was just a kid then, but I remember the horrific images of Bloody Sunday—the 7th of March, 1965—when hundreds of marchers were stopped, beaten, and tear-gassed on the Edmund Pettus Bridge by police and county posse. Martin Luther King, Jr. led the next two marches, the last one making it to Montgomery under federal protection. All week we’ll discuss the marches and their effects, but today I want to ask this: Did MLK love America? I raise this question in part because of recent claims that Obama doesn’t love America. It’s ironic that his patriotism has been called into question on the anniversary of the Selma marches. It began when former New York mayor Rudy Giuliani said in a speech that the president “doesn’t love America.” Overall, about a third of all Americans (35%) say Obama doesn’t love America, according to a YouGov.com poll. Republicans are much more likely to say Obama doesn’t love America, while the vast majority of Democrats (85%) say he does. So, what about Dr. King? Did he love America? The answer depends more on when you ask than who you ask. For example, consider the results from a survey technique called the scalometer. This technique presents a respondent with a 10-point scale ranging from +5 to -5. In 1966, 41% of Americans rated King -5. Almost seven of ten Americans (68%) gave negative ratings. Twenty years later, a huge shift in public opinion took place. In 1987, 76% of Americans gave King a favorable rating. This favorable rating has held firm. In 2013, for example, a poll by Rasmussen Reports showed that 80% of Americans had a favorable view of the great civil rights leader. Almost half had a very favorable view. I have no doubts that King loved America, and that Obama loves America. They were what I call “critical patriots” in my recent book United America. They see what America should be and can be—and want to the nation to live up to its ideals. What’s your opinion of Martin Luther King, Jr.? If Polls Ruled: Would we continue to have freaky storms like Juno? Juno—the massive winter storm pounding New England—isn’t quite the historic storm the National Weather Service predicted. But climate change scientists attribute Juno (and the severe, variable weather we’ve had in recent years) to global warming. If polls ruled, what would the majority of Americans want done? These majorities, however, are lower than they used to be. Gallup’s data shows a downward slide in support for these two emissions proposals. In 2003, for example, 80% of Americans favored setting higher standards for business and industry, and 75% favored imposing mandatory controls on emissions and greenhouse. Meanwhile, one of Congress’s leading global warming skeptics—Senator James Inhofe of Oklahoma—just voted in favor of a resolution that “climate change is real and not a hoax.” However, he continues to scoff at the idea that climate change has anything to do with human activity. Do you favor higher emission standards for business and industry? Do you support imposing mandatory controls on carbon dioxide emissions and other greenhouse gases? Should public opinion set climate policy? Share this column on Facebook or by email. You’re also free to print it out and share it that way. If Polls Ruled: Should public opinion decide policy? Would our system of government work better if public opinion ruled? Republicans and Democrats can’t agree, but a majority of Americans agree on a number of key policy proposals. Should public opinion set policy? One way to look at this is to examine public support of the proposals Obama outlined in his State of the Union (SOTU) address. Gallup analysts have done just that for 10 key proposals. This week, we’ll examine two each day. Today, we look at proposals related to economic policy. Do Americans want to raise the minimum wage? In his SOTU address, Obama urged Congress to raise it. Gallup last asked about this issue in November 2013. Then, three quarters of Americans (76%) were in favor. A January 2014 Pew poll found similar levels of support. Do Americans want to strengthen labor unions? Right-to-work laws weaken unions. Obama said that we need laws to strengthen unions. Gallup reports that a majority of Americans (53%) approve rather than disapprove of unions. Since 1936, Americans have been more pro-union than anti-union. But, Gallup polls also show that an even larger majority of Americans (71%) favor right-to-work laws. The full impact of right-to-work laws is yet to be determined. Michigan is now a right-to-work state. Union membership fell sharply in 2014, reports the Detroit News. The drop is attributed to the law. Would you like to see laws that strengthen labor unions? Financial Insecurity: Better times ahead? For whom? PERCENTAGE OF U.S. INCOME CONTROLLED BY THE TOP 1 PERCENT OF AMERICANS. The trend is clear even if the exact percentage earned by the “Top 1%” depends on the specific economic formula used to build the chart. Here are three formulas for charting the trend: BLUE is a scale developed by economists Thomas Piketty and Emmanuel Saez to chart the rise in pre-tax income. RED is a Congressional Budget Office (CBO) scale charting pre-tax income. GREEN is CBO’s after-tax chart. We live in a time of record levels of economic inequality. Many Americans are financially insecure, unable to pay their bills, relying on government assistance, and lacking savings or retirement accounts. But are better times ahead? This week, we’ve focused on financial insecurity, drawing on a new survey by the Pew Research Center. The big finding is that financial insecurity leads to political disengagement. The most financially insecure are unlikely to vote and don’t express preferences for Republican or Democratic candidates. This is true for the general public and for white Americans. And, the most financially insecure Americans believe that corporations make too much profit. Now is a good time to find a quality job. Gallup’s January 2015 survey shows that 45% of Americans think so. This is the result of an upward trend that started from a low of 8% in November 2011. It’s close to the highest figure Gallup has reported (48% in January 2007). Personal satisfaction is trending upward: Gallup reports that 85% of Americans now say they are satisfied with the way things are going in their personal lives, which is the highest figure Gallup’s seen since before the recession. Economic confidence is at a record high, according to Gallup’s Economic Confidence Index. Gallup started the Index in 2008. The big question, of course, is whether the economic recovery will trickle down to the most financially insecure Americans. Do you see better economic times ahead? Do you think the recovery will trickle down? Or, do you think that the recovery will mainly benefit the middle and upper classes? Financial Insecurity: Are financially insecure whites apathetic? A GOP campaign sign in rural Texas. Provided for public use by Billy Hathorn via Wikimedia Commons. Do white voters shun Democrats in favor of Republicans? After the 2014 elections, many analysts were saying yes—Democrats were not as appealing to white voters, especially the white working class. But reality is more complex, once we factor in different levels of financial security. The most financially secure white voters did favor Republican candidates before the election, according to the Pew survey we’ve consulted all week. But it was a slim majority—just 51%. Just over a third favored Democratic candidates. What are the preferences of the most financially insecure white voters? Their preference for Democratic candidates (37% in favor) is about the same as the most financially secure white voters (39% in favor). These two groups differ dramatically in their support of Republican candidates. Only 21% of the bottom group preferred Republican candidates. More than twice as many voters in the top group favor Republicans as well. Voter apathy is the biggest—and most startling—difference between financially secure white voters and financially insecure white voters. Only 10% of the top group didn’t express a preference for Republican or Democratic candidates. Forty-one percent of the bottom group didn’t express a preference one way or the other. Voter apathy isn’t a monopoly of financially insecure white voters. The same is true among the general public: those who have trouble paying their bills, depend on government assistance, and don’t have a checking, savings, or retirement account are simply disengaged from the political process. Why are financially insecure whites apathetic? How do we explain voter apathy in the general public? Share this column on Facebook or by email. You’re also free to print it out and share it that way..
Financial Insecurity: Do the insecure hate business? OCCUPY WALL STREET 2011. This is one of many photographs by David Shankbone that were uploaded that year into Wikimedia Commons for public use. Remember “Occupy Wall Street”? This protest movement focused on record levels of economic inequality and proffered the catchphrase “We are the 99%” to highlight the huge share of wealth enjoyed by the top 1%. We haven’t heard much about the movement lately. But financial insecurity is still with us. Are the most insecure still anti-business? At the other end of the scale, attitudes about business are different. Only a third (32%) say that corporations make fair profits, while two-thirds (65%) say that they make too much profit. We see the mirror image in opinions about government inefficiency. Almost two-thirds of the most financially secure Americans say that “government is almost always wasteful and inefficient.” Just a third of these Americans say that “government does a better job than people give it credit for.” The most financially insecure Americans are equally divided between these two positions. Do you think that business corporations make fair and reasonable profits? Is government almost always wasteful and inefficient? Financial Insecurity: Does insecurity make you a Democrat? Click this Pew graphic to visit Pew’s website and read the entire report on this poll. The rich vote Republican and the poor vote for Democrats, right? That’s what stereotype says. How true is it? Reality is a lot more complicated than the stereotype. Almost half of the most financially secure Americans (49%) prefer Republican candidates—but 42% of this well-off category favor Democratic candidates, according to results from a new survey by the Pew Research Center on financial security. Only 10% don’t express a preference. Americans in the most financially insecure group have different preferences, but not what you might think. These Americans have a lot of financial difficulties, rely on government assistance, and don’t have checking or savings accounts. You would think that their financial insecurity would compel them to favor Democrats because Democrats promote policies that help the poor, right? Well, the most financially insecure do tend to prefer Democrats—42% of this group says so. Only 17% prefer Republican candidates. But—and here’s the startling finding—41% don’t seem to care one way or the other. Even if they do have a preference for one political party over the other, the financially insecure are unlikely to vote at all. Their preference for Democrats doesn’t translate into an advantage for Democratic candidates because these voters don’t show up at the polls. The financially insecure are disengaged from the political process. What do you think of the fact that the most financially secure Americans drive politics? How can we engage financially insecure Americans in the political process? Share this column on Facebook or by email. You’re also free to print it out and share it that way. 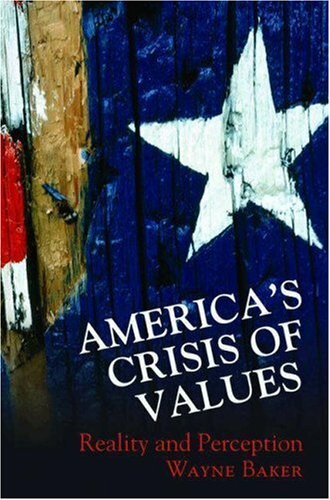 And, if you haven’t done so already, please help support the OurValues Project by ordering a copy of United America.